Register early (limited seating). This is a monthly art class meant to bring out artistic expression, playfulness and fun! Students will copy a painting step by step while brushing up on new techniques. There is no art requirement. just come and have fun. Art materials will be provided. Optional: Bring your favorite beverage and a snack to share. I am an experimenter of all things art! 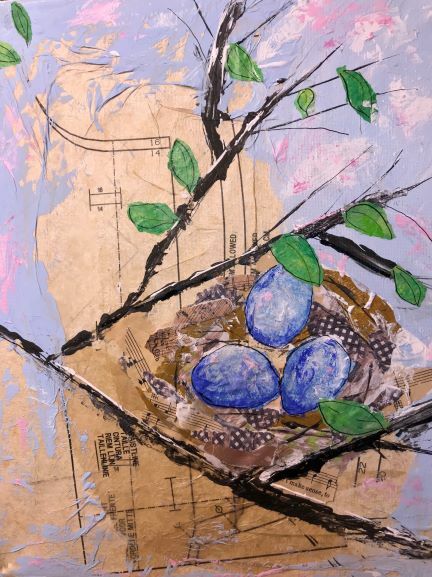 Painting, mixed media and quilting are my favorites so it was natural for me to combine those arts into what I call “Collage Fabric Painting.” I recently retired from a career of teaching all ages various subjects. I am now excited for the opportunity to use both my skills as a teacher and an artist to introduce others to this fun way of experimenting.